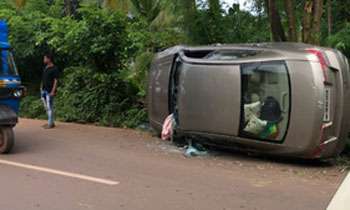 A 31-year-old man and his 3-year-old child were killed while his wife sustained injuries when the car they were travelling in skidded off the road and toppled at Kumdukwela in Ella yesterday. Police said the victims were admitted to the Badulla Hospital and the man and the child succumbed to injuries. The mother of the child is undergoing treatment at the Hospital. The victims were identified as residents of Weliarawa. Time has come for the proper experts the Physicists to take over the designing of vehicles from the Engineers whose knowledge of Physics and Mathematics is very limited.This kind of tragedy should not happen in the 21st century. Only the engineers would vote against this important comment.Peoples lives are infinitely more important than the artificially hyped engineering education. IN THAT CASE , EMERGENCY MEDICAL UNITS SHOULD BE SET UP EVERY FIVE KILOMETERS. Accident never happen ..but it occurs. Heart breaking incident. May they rest in peace and may god help the mother to overcome her difficulties. Came on Southern Express Way yesterday! Most of the drivers don't seem to know how to drive on a highway! The minimum distance is never maintained!!! many people drive on the expressway as if they are on a normal street WE CANNOT HAVE driving discipline and rules one for the roadways and another for the expressway. some idiots will try to pass another vehicle just in front of you by cutting you off thinking that you are able to stop.